The Detection of the NAVSPASUR RADAR by Moonreflection or Passive Satellite Reflection in Eindhoven, The Netherlands. 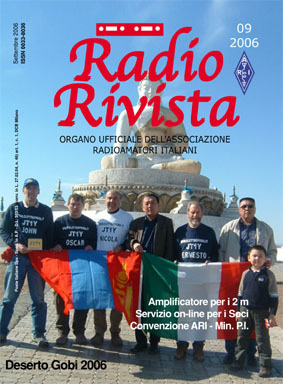 Distance between amateur radio station PE1ITR and the Navspasur Lake Kickapoo site is 8354 km. The radar is transmitting a continues wave at 216,980 MHz. The question: Is it possible to receive the NAVSPASUR, Lake Kickapoo, USA Radar on 216.980Mhz in Eindhoven, the Netherlands by moon reflection? I became very enthousiastic about it and also tried passive satellite reflection to get the radar signal across the Atlantic ocean. This experiment needed some equipment improvement but yes this also can be done! . This website documents the results and equipment setup of the experiments I started on februari 27, 2004 until now. You can find on this website a real-time navspasur monitor station and a description about my old and new station. Also some thoughts to get more science out of the moonreflections. Gila River 216,970Mhz Location: N33 6' 7" W112 1' 7"
Lake Kickapoo 216,980Mhz Location N33 32' 46" W98 45' 46"; This is the strongest with 767Kw RF power and 40Dbi antenna gain. 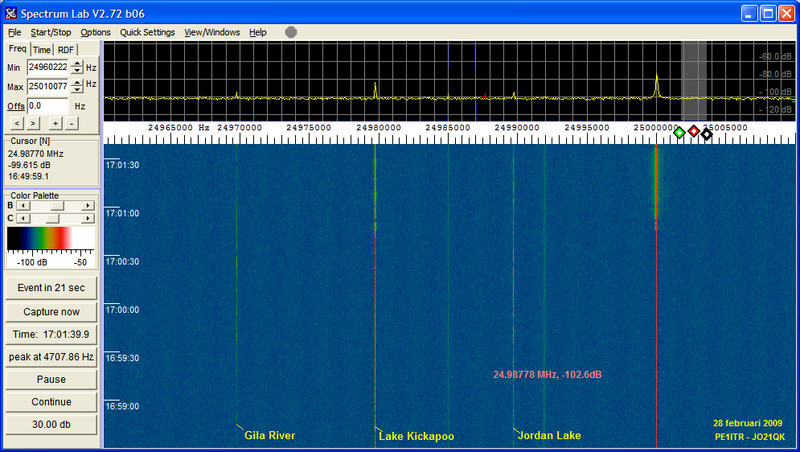 Jordan Lake 216,990Mhz Location: N32 39' 1" W86 14' 58"
Tracking satellites from my back yard using the Navy Space Surveillance Radar , by Tom Kneisel, K4GFG. 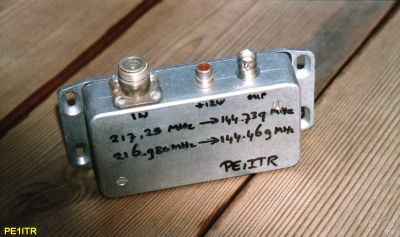 Converter from 216.980Mhz to 144.469Mhz with BF981 as frontend; Circuit. ICOM IC-910H as SSB receiver. Laptop computer for visual audio analyses and signal recording. manual AZ and EL antenna control. Nova for Windows software for link calculations. 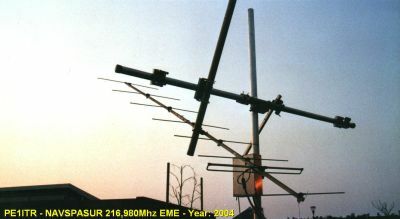 2 x 14 elements (4wl) x-pol yagi antenna. 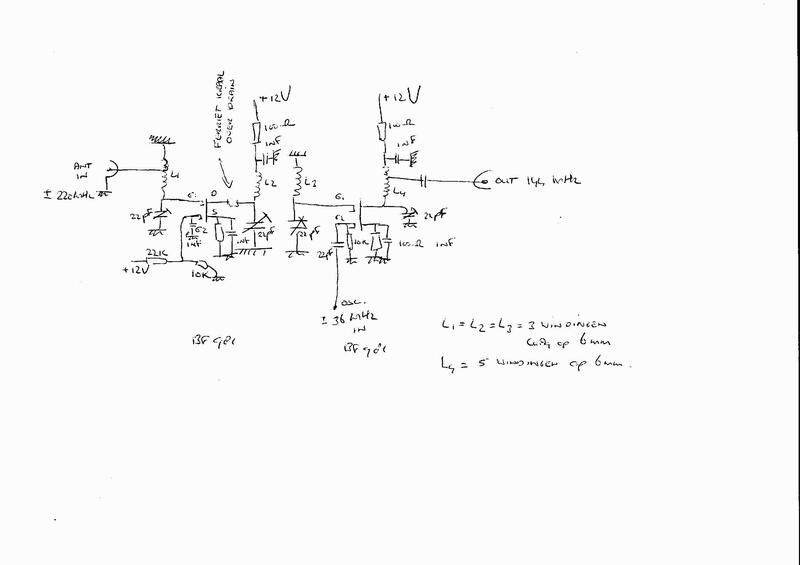 3sk183 GaAs-fet pre-amp for each polarization. manual AZ, EL and polarization control. Nova for Windows and TRAKSAT fr link calculations. The navspasur transmitter is very powerfull with 767KW output. The antenna radiation pattern has the shape of a "fence" straight up and is aligned in the east-west direction. 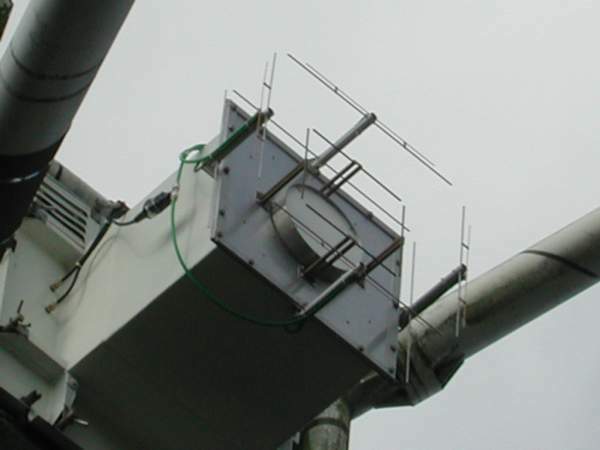 Antenna gain is 40db. See red line in the picture on the left. When the moon is around 91,4 degrees azimuth from the Lake Kickapoo transmitter, it goes through the thin "fence" and moonreflection is happening. So far I succeeded to receive the reflection when the moon is >3 degrees elevation above the horizon seen from the lake kickapoo site. It is also possible to receive reflections from the two smaller transmitter sites, Gila River 216.970Mhz and Jordan Lake 216,990Mhz. Seen from the transmitter locations the azimuth is 83,9 degrees and 98,1 degrees. The peak reflection is about 7 minutes. It can be heard on speaker level. With the use of DSP the reflection can be detected for 2 hours and sometimes more. Here's an audio recording of the signal from my first attempts on februari 28th, 2004. 1. Short recording [300kb] - 2. Long recording [5.6Mb]. Here is an example of a reflection received from 216,980Mhz transmitter. Also waterfall display pictures from reflections of the two smaller transmitters. I have made an archive from all the receive events so far. It can be accessed via this page. The satellite reflections received from the radar received in the netherlands are weak. The length in time of a reflection can vary from from 10 seconds to 10 minutes or so. There are also some conditions to the orbit of satellite to get a reflection on this side from the atlantic. 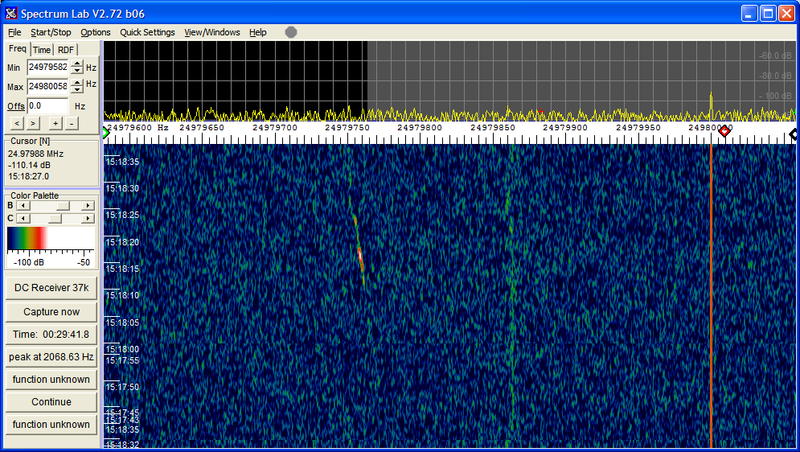 First both observers, me and the radar, must see the satellite. This means that the satellite altitude above earth is greater than 5000Km. 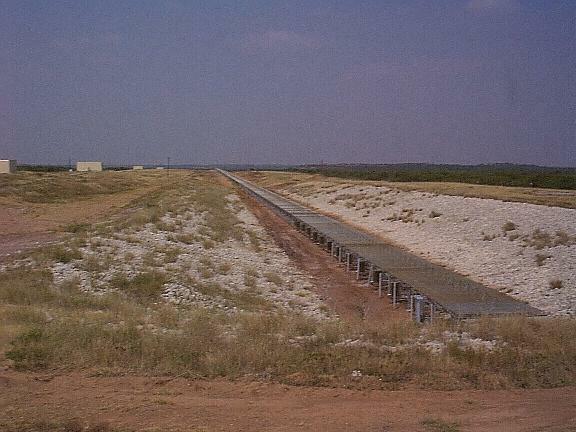 A very important condition is that the satellite must fly through the fence, so the inclination must be greater than 33 degrees. The satellite must be big enough to get a good reflection. This can be derived from the RCS value (Radar Cross Section). Another important factor is the doppler shift. The doppler shift can be very different and depends very much on the orbit geometry between the two observers. From calculations and observering it turns out that high eliptical orbits with a apogeum of around 20000Km and a low perigeum of 1000Km are giving the best results. For example the ARIANE R/B object 25990 gives very reliable results. I received also a lot of reflections I can't figure out which satellite is responsible for. Here is more information about howto receive satellite reflections. 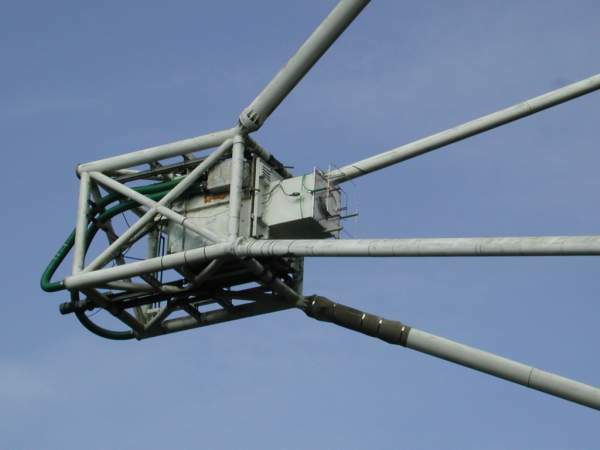 Another exciting experiment was the use of the 25m dwingeloo dish to receive reflections. Eene PA3CEG made 4 217MHz dipole antenna that where mounted into the feed of the dish. 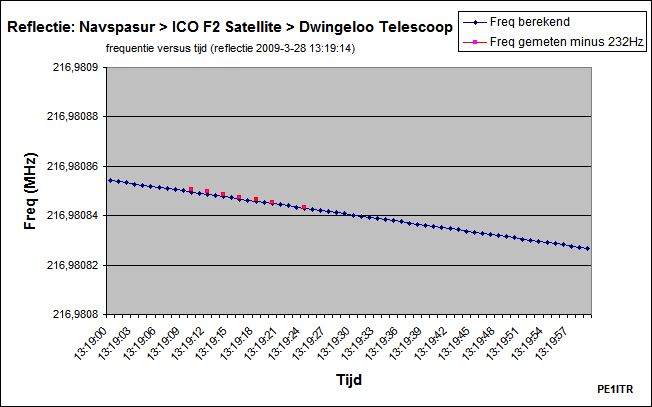 And we received a reflection from the icof2 satellite. Here is the audio recording. Audio recording ICO F2 reflection. screenshot of echo. echo at 24.979MHz. This is the IF of th econverter used. Can we get more science out of the moonreflections? Two ideas came up to me. 1. Polarisation measurements from the moonreflections. The navspasur signal is lineair polarized. 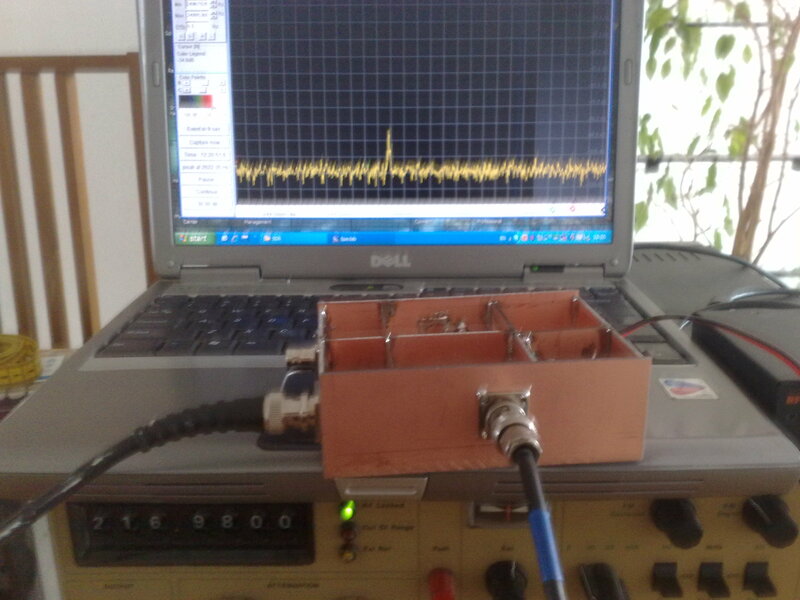 At the moment I'm using two seperate channels for each polarization of the x-pol antenna. The output is fascinating. I'am working on to get a better output, but at the moment I can't compute the information to usefull information/knowledge. 2. To make a network of receiving stations. The data of the received signals could be published "real-time" on internet. The data is then transformed into an index saying something about the moonbounce propagation. It would be useful information for 144 and 432Mhz EME QSO's. Moon > (Fixed) Antenna > 216,980Mhz Converter/Receiver > Audio Analyses/Computer > Internet upload > Webserver > User. **New** Real-time NAVSPASUR Monitor (not always active; see schedule). Please contact me if you want to join the EME propagation network and also want to upload your live waterfall images to the website. Markus Vester, DF6NM developed a method to do Time-Doppler Imaging of the moon with use of the navspasur fan beam at 217MHz. The results are amazing. He wrote that in the classical sense, the time axis is radial distance, but this is obviously not accessible by a CW radar. His thought was that resolution in the south-to-north direction could be supplied by the narrow fanbeam. The east-west axis would be subject to a daily libration component due to the changing aspect angle, caused by both the TX and the observer rotating eastward on the earth surface. So there will be a Doppler difference between the eastern and western fringe of the moon. Here is the link to the interesting webpage of Markus, DF6NM with very nice pictures. - DF5AI.net Amateur Radio Propagation Studies NAVSPASUR Radar Experiments April 6, 2006. Disclamer: The author is not responsible for the contents of pages accessed via hyperlinks from here.